Etobicoke York Community Council has asked the city to put the Mount Dennis Scotiabank on their heritage list. After the property had been threatened by the Eglinton LRT, The Mount Dennis Community Association lobbied to have it protected. The bank, which hadn’t really rung my bell, is, in fact a little architectural gem. 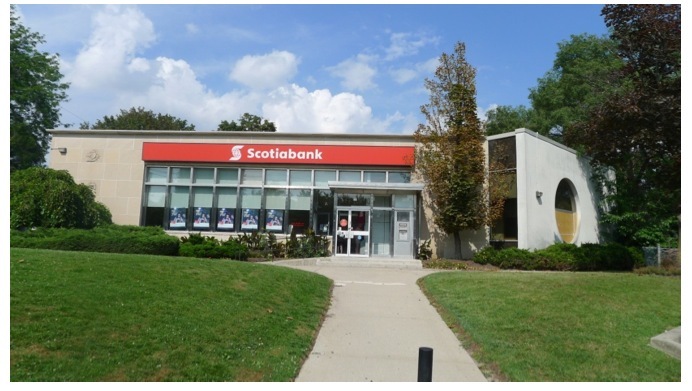 Crowning the public open space at the northeast corner of Weston Road and Eglinton Avenue, the Bank of Nova Scotia is a significant example of a post-World War II bank branch designed by the influential Toronto architect Gordon S. Adamson. Expressive of the change in architecture and society following World War II…. the building’s Modernist features exemplify this new sensibility in the simple one-story L-shaped form, flat roof extended in a shallow plane, asymmetry and extensive use of stainless steel and glass. In contrast, traditional Classical elements are present in the Indiana limestone cladding and the three stone panels carved in relief with the elements from the bank’s seal: the Bluenose Schooner, a codfish and wheat with a plough. 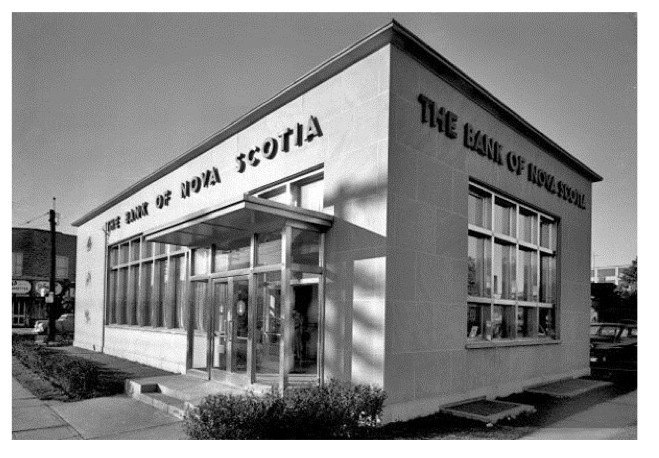 Selected in 1950 by the Journal of the Royal Architectural Institute of Canada as one of fourteen branch banks in Canada representing social and architectural changes after World War II it continues to be a dignified and accessible community facility. The Community Council decision must still be approved by City Council at its next meeting, in November.